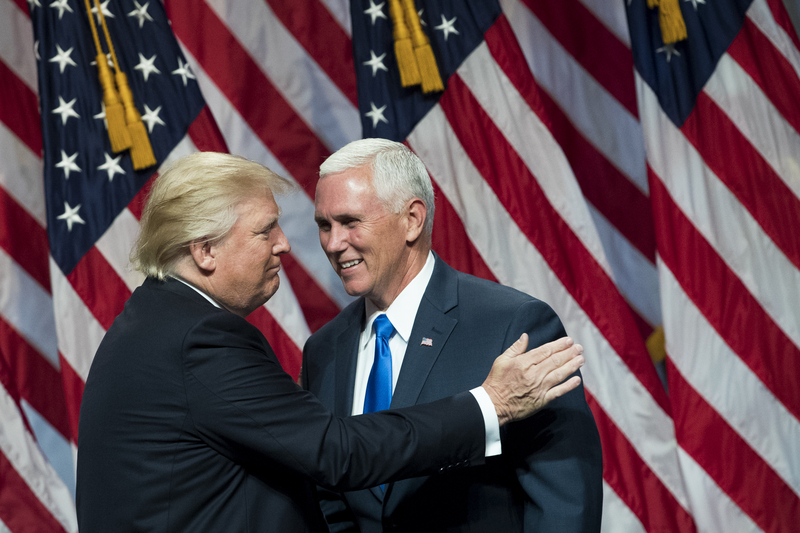 Just days into their presidential-vice presidential campaign, Donald Trump and Indiana Gov. Mike Pence are already backtracking. On Friday, they rolled out a campaign logo that was mocked relentlessly by the good people of the internet for its suggestive nature. And by Saturday's press conference, the first time that Trump and Pence appeared together in public since Pence was announced as his running mate, the logo had already been axed. As of Saturday, the Trump-Pence logo had been updated to something less, uh, titillating. It took all of five minutes for the internet to tear down the initial logo, which featured an interlocking T and P against the red and white stripes of the American flag, after it was posted on Trump's campaign site and blasted to the media in an email. Social media users quickly noted that not only does "TP" evoke something that should be near a toilet, but that the T seemed to be penetrating the P in a sexual manner. It didn't take a lot of imagination to see it, but just in case, an animated GIF of the logo quickly made rounds around the internet. Full Frontal host Samantha Bee tweeted out the GIF with a message: "Breaking the mattress of America." Now do you understand? Obviously, the Trump camp reads the internet, because the logo was quickly yanked down and replaced with a new version that barely resembled the first. This is the second design mishap that the Trump campaign has had in the past few weeks. Donald Trump recently tweeted a photo of Hillary Clinton's face, photoshopped over a blanket of cash, and had what appeared to be a Star of David that called her the "most corrupt candidate ever," in a move that many criticized as anti-Semitic. That was also quickly yanked down, replaced with a version of the same banner but with a circle where the six-pointed star once was. Trump's design team needs to get it together, apparently. It's like the same quick-fire judgment that the candidate uses to run for president is employed by his graphic designers, with little to no thought about how the designs could be received by anyone outside of the room. Because even with Trump's quick action to remove the maligned logos, we know that the internet never forgets. Until he learns, we'll be laughing (or crying) along with the rest of Twitter.